Chart No. 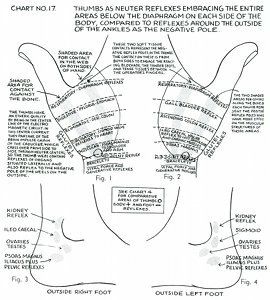 17 - Thumbs as Neuter [Neutral] Reflexes Embracing the Entire Areas Below the Diaphragm on Each Side of the Body, Compared to Reflexes Around the Outside of the Ankles as the Negative Pole. The thumbs have an etheric quality by being in the center line of the electro magnetic [electromagnetic] circuit. In this center current they partake of the brain impulse chain of the caduceus, which cross over from side to side through neuter [neutral] centers, so the thumb webs contain reflexes of organs situated laterally and also reflex to the negative pole of the heels on the outside. 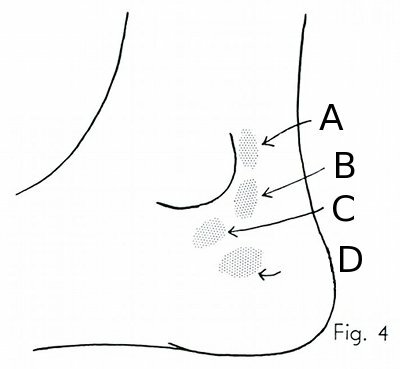 (A) Shaded area for contact against the bone. (B) Shaded area for contact in the web on both sides of hand. 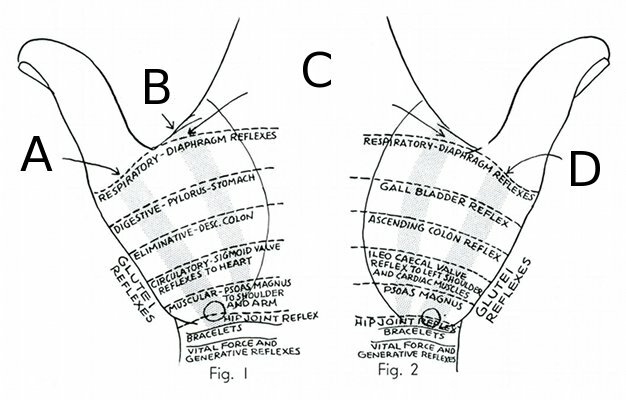 (C) These two soft tissue contacts represent the negative reflex poles in the thumbs. The contact on these is from both sides to engage the reacting blockade, the tender spots, and tense tissues between the operator's fingers. (D) The two shaded areas for contact along the bone of each thumb represent the positive reflex poles which have more effect on the muscular structures of those areas. 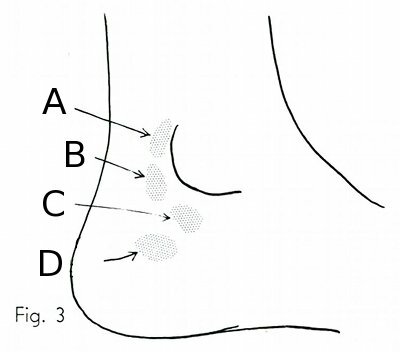 See Chart 4 for comparative areas of thumbs 0 body + and foot - reflexes.